The millet flour can be prepared in two methods. You may follow the method suitable for you. Take 1 kilogram of Sorghum millet. Dry roast the millet in a pan in low flame until it pops-up. Turn off the flame and let it cool completely. Grind the flour in flour mill. Sift the flour if required and store it for future use. Take 1 cup of flour to make sweet balls. If you have store bought millet flour readily available at home, take 1 cup of it and dry roast until it gives a nice aroma. Turn-off the flame and let it cool completely. In a wider bowl, take Sorghum flour. Add cardamom powder, roasted Chickpea gram and roasted Sesame seeds and mix all these ingredients well. In a separate container, take crushed Jaggery ball and add water in it. After the jaggery is dissolved completely, filter it to remove impurities and start boiling the syrup. Keep a small cup with water beside the stove. Keep stirring the syrup in between. After 10 to 12 minutes of boiling, the syrup will start becoming thicker. To check the right consistency of the syrup, take few drops in a spoon and pour in the small cup with water. If the drops do not dissolve in water and stays thicker at the bottom of the cup, then turn-off the flame. Pour this syrup in the flour bowl and mix it with ladle. Let the mixer becomes slightly cool. Now you can mix the flour once again with hand and take small quantities of flour and shape them to balls. Porivilangaai laddu is a very common sweet item prepared in Tamilnadu using rice flour. I have followed the same recipe by just replacing rice flour with Sorghum flour. If the jaggery syrup is too thick, then the laddus will become very hard to bite. So we need to turn-off the flame when the syrup is in right consistency. 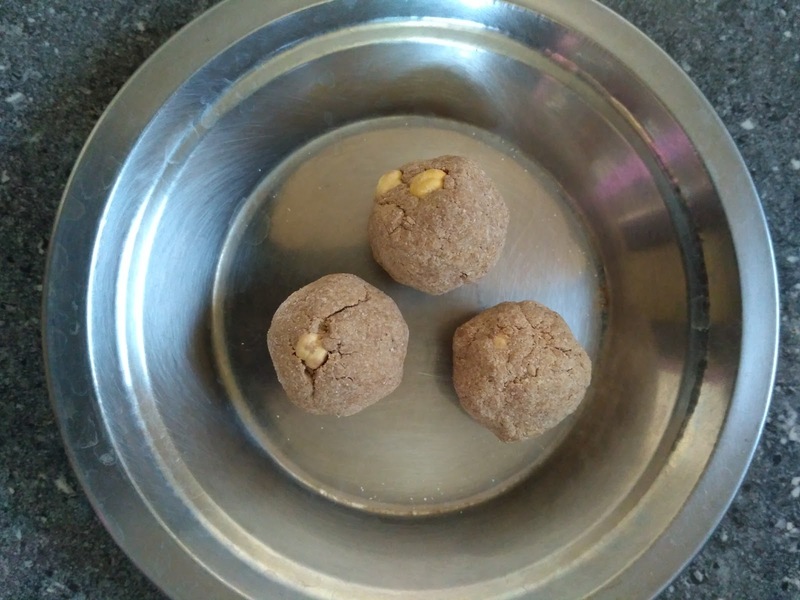 After pouring the syrup in the flour mix, if the mixer becomes dry immediately and you are not able to shape the laddus, add little hot water, mix the flour once again thoroughly and then make laddus. Usually in rice porivilangaai laddus, people use coconut bits, sesame seeds, roasted Chickpeas and Groundnuts after roasting them in ghee. As we do not recommend oil in Life Natural for cooking, I have dry roasted sesame seeds only and added roasted Chickpeas directly. Sorghum flour laddus can also be prepared with less quantity of oil. If you would like to try that version refer this recipe. You can use also this recipe and make Porivilangaai laddus with Pearl (Bajra) millet and Finger (Ragi) millet.